A sleek addition to the world renowned “Tracy International Yacht Boarding Stairs Line-up”. 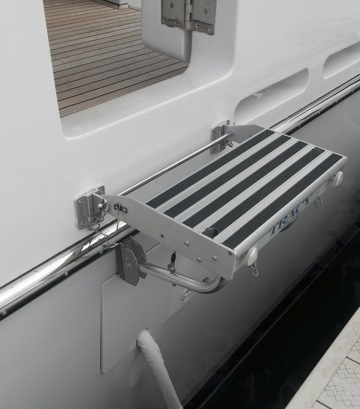 The Tracy “ Deck to Dock Step ” is a must have for any vessel. When you’re finished tying up your prized vessel to the dock, and it’s time to depart for a day of exploration, or just an evening dinner at the best dining establishment on the island, there is always that ominous gap between your yacht and the dock and you say “It’s a little too far”, to safely board and depart the vessel with ease. The design team at Tracy has the answer to gap. Just add the “ Deck to Dock Step ” and your worries are gone. Quick and easy deploy or remove, the light weight design, stores easily in any small stowage compartment. The user friendly mounting system makes this a great addition to any vessel. The “Deck to Dock Step” is sold separately from each of its additional components. All discerning Yacht owners most likely have the “Tracy Yacht Stairs Mounting System” for their boarding stairs already installed on their Yacht. Why pay extra for hardware that every yacht owner already has. The “ Deck to Dock Step ” is an easy addition to the TRACY YACHT STAIRS LINE. Includes: 1 Step, 2 BL-Standoffs. A set of polished S/S Brackets that permanently mount to the vessel. A set of polished S/S Quick Release Brackets that slide into the BL Mounts to attach the “Deck to Dock Step” or any Tracy Yacht Stairs. Picture shown, not a standard installation. Has been modified to fit this vessel.